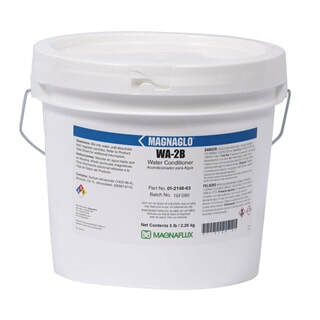 WA-2B is a general-purpose water-conditioning powder to enhance surface wetting and magnetic particle dispersion stability in water-based magnetic particle suspensions. Its unique blend of wetting agents, corrosion inhibitors and anti-forming agents eliminates the need for additional water conditioning agents. A white granular powder that is added to water baths in wet method magnetic particle testing with no further bath treatment required. WA-2B features good surface wetting and particle dispersion, and will not cake in storage. WA-2B is added to the water bath and stirred until dissolved before the magnetic particles are added.